When we first bought this washing machine, we were told that it was the most higly rated front loading washing machine out there. We wanted a front loader because I am to short to reach a top loader. The features on it are impressive-it can steam wash, and can dampen the sound. It is also supposed to kill all of the odor causing bacteria. I have never had a problem with this-it actually seems like it does kill the bacteria. However, apparently something in this washer that kills the bacteria, also disrupts our nearby ponds and lakes. Even though the washer does this, it uses a lot less water than most washers-therefor making it more efficient. This washer was quite expensive, but for the amount of money that we had spent on it, it seems to look old very quickly. It scratches and dents with very little force. The look when it was brand new was very nice however. Also this washing machine is very quiet, and you don't even know it is running. Despite the small flaws that this washing machine has, I love it, and will continue to use it. - Possibly bad for environment. We've had ours for over two years now. Bought it from Sears dent and scratch area. Was still brand new but only paid $900. It's large capacity and cleans well. Silvercare is an effective way to sanitize without harsh chemicals like bleach. Downsides- cycles are long! It spends a lot of time doing nothing. Also, we've had two major incidents in the two years we've owned it. First was a broken glass door. Expected to find a rock in the kids clothes, but nothing. Still not sure what shattered the thick I interior glass. What a mess to clean. All clothes in the cycle ruined with shards of glass or torn to shreds. Samsung was non-responsive. Local appliance repair shop replaced the glass and helped finish cleaning internal components. Cost several hundred dollars to repair and only a year old. Appliance repair shop said they had never seen this happen. Second incident was after two years. Outer spring ring holding gasket came lose and tore several garments during cycle. Also, leaked much of the water causing a flood in our house. Spring ring replaces but gasket still weeps water onto the front of the machine. We are certainly disappointed as this machine received top reviews from Consumer Reports and JD Power. We are considering replacing it. Will definitely go back to top load, but probably high efficiency. I have now had 2 samsung washers at my home within a week, while they claim to conserve energy, both machines have gotten "stuck" on the spin cycle, machine goes out of balance and will not spin out, so it resets to 15 minutes and starts the spin cycle over again, It has taken 1 hour and 45 minutes to complete one load of laundry! Piece of CRAP!!!!! I bought this set in 2009 & love it. Only problem I had was water leaking from the soap dispenser. Took out the dispenser & cleaned it both inside & out, also cleaned the area inside the machine where the dispenser goes. I had been using power soap & there was a build up of soap that hadn't disolved. I was told not to use the same amount of soap that I would on a top load. I now use only liquid soap & have had no more problems. I also leave the door open for about 30 minutes or so after the last load to help the inside dry to prevent that moldy musty smell. buyer beware. I was washing a cycle of clothing and while the washer was running I was in another room of the house. After about 10 minutes into the cycle, I smelled smoke and didn't know where it was coming from. Well it was coming from the back of the washing machine-- black smoke. I turned the washer off and called 911. They told me to leave the house. When they arrived, they pulled the washer and dryer out to examine them. They agreed it was coming from the washer, and advised me not to use it again. Totally disappointed with this product but happy my house didn't burn down. Would never buy another Samsung washer again. It's going to be removed from my home. Lowes states no other customer has complained of this problem. ...but after 6 months,4 leaks (all different sources,but not the door seal,oddly enough) and about 5 weeks with no usable washer,I returned it to Lowe's. I had purchased the additional coverage offered,so 4 strikes = new machine. I opted for a different HE washer and dryer pair with a 60 day in home trial,no questions. 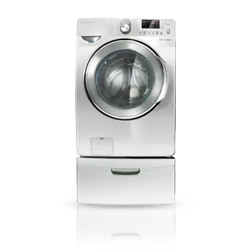 We have had our Samsung WF448 washer for a week now and have washed many different items in it. They have fixed the liquid soap dispenser, if you have the older style try calling Samsung and get the new Liquid Soap syphon dispenser, as it does work very well (Ours came with one). As for the laundry softener dispenser it works just like it is supposed too as well. We have not tried the bleach yet as the washer gets everything so clean and white without the need for bleach. It is a very quiet washer and very stable, the most it eve shaked so far was when we washed a king size duvet cover all by it's self, and then it only shook for a few seconds then smoothed it's self out and continued to ramp up the speed. Yes it takes longer to wash than a top load, but it cleans so much better with let water and power, and spins out so much water that it dries quickly in the dryer. Not to mention you can do 2 loads (for a regular top loader) at once. What more could you ask for? We sre very pleased with our purchase. But remember you use very little soap as it uses so little water too. The most soap we use is 2 tablespoons and our laundry comes out very clean. This washer is very impressive, and is sweeping the nation in households everywhere. There have been very good ratings around the web, which led me to purchase it online. It has great capacity for larger loads, and has very many different options such as steam wash and sanitize cycles. It is easy to lift your garments out of the bin. There is also a noise reduction option, and vibration cancelling. The sanitize option is supposed to kill bacteria in the garments by using silver ions. Some people say that it is an environmental hazard, but that has yet to be determined. I personally like that its quiet, because I put it in my apartment, and any little noise is quite a disruption. I use the steam wash for my work uniforms, and they turn out very nice, all of the stains have come out without pretreating. My biggest issue with it was the price. I paid about $1600.00 USD after tax for it, but I wanted to buy something that would do a great job and last awhile. It has a very nice stainless steel finish which fits with the rest of my appliances, and it also comes in Neat White. There is a very easy control panel with presets to make washing a breeze. There is also a delay start to time your washer for when you won't be around. Another downfall however, is that the silver plating (for ion technology) will have to be eventually replaced, which could be costly. Also, the water hose and power cord were a little too short for the spot I needed to place it ( I believe the cord was only about 4 feet). Overall, this is a great washer and the pros definitely outweigh the cons. I HATE this washing machine! This washing machine is the worst I have ever owned. I've had front loaders before, but this one is so frustrating. The soap dispenser tray doesn't work like it should. It leaks soap, bleach, softener. I was told by the repairman that it was just a bad design and they couldn't fix it. Nothing like getting bleach pouring on your clothes before the cycle even starts. This machine does not get anything clean. I now pretreat everything, use Hot water on almost everything and still have stains that any other washer I have used would get out. There is lint on everything I own. Even stuff I have had for ages without any problem. Nothing like buying new clothes and then having them lint covered after a wash or two. Don't buy this machine -- find a different one! !